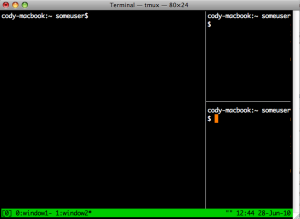 I’m a big fan of tmux, I think it’s an absolutely essential part of any environment where access to a terminal is required. Great blog post though, I learned a few tricks here. I think the only thing with tmux is its documentation, I’d rather have a website for documentation than reading the man page — just personal preference. Front page of /r/linux, nice! I feel like an idiot asking this, but I’ll blame it on my mac keyboard. Do you mean ctrl + b? Mac must have different scan/alt codes than a pc keyboard. @Andrew Yes it’s ctrl – I use a Mac as well. Thanks for posting this. 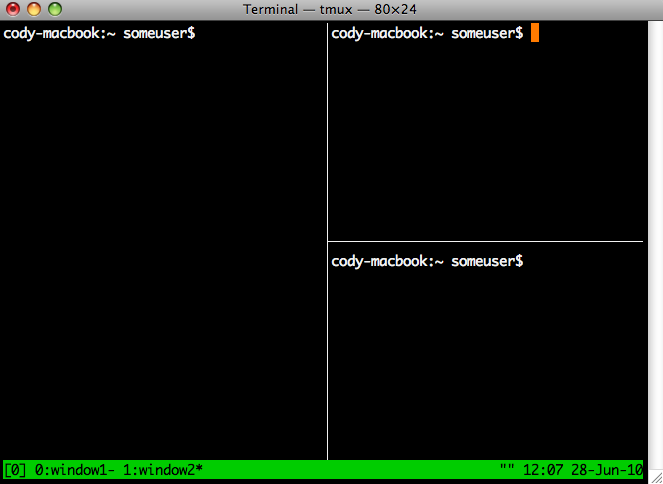 I have just begun using (and loving) tmux. You made some sense out of some of the commands that I didn’t understand in the man page. Thanks to your article I’ve switched from screen and added tmux support to my home skeleton script suite: http://github.com/dpc/homeskel . I thought Yakuake is a much better tool. You don’t have to remember all of the commands, right click on the shell section on the right you are able to split the screens along with other things, click on the right drop down and you can enlarge the screen based on your preference. press f12 to remove the screen all together, there is a drop down that allows the user to do it automatically. As long as it gets the job done, I think that is all that matters. My windows keep getting automatically renamed after I have manually renamed them. 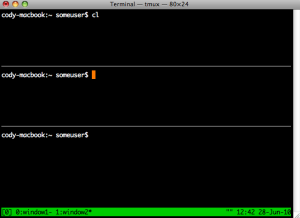 I have “setw -g automatic-rename off” in my .tmux.conf. Am I the only one with this problem? I really love it. I have been screen user most of my life. I can’t seem make the vertical pane patch to work with screen 4. 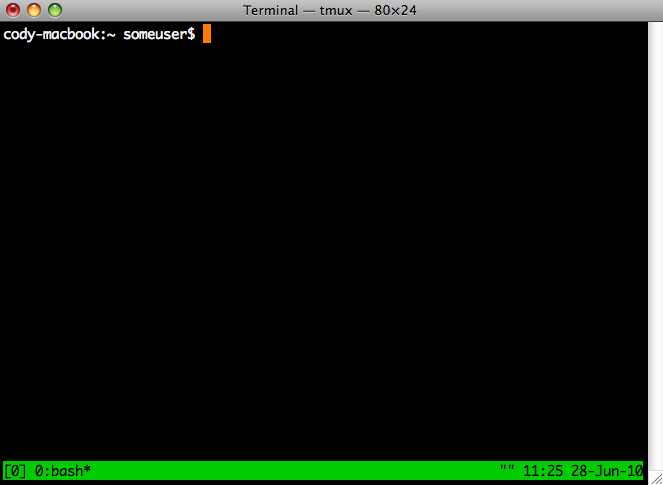 But now I have tmux, what the heck!!! One thing I find annoying is the shortcut, C-b. Man, why dont they just make it C-a. C-a is a lot more economical to type. At least for me I have to use both hands to press C-b. Is there a way to fix it? 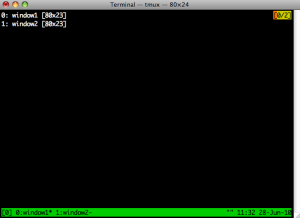 Yakuake is cool, but tmux works almost anywhere. The note above uses Ctrl-a which errors on my system, and neglects to unbind C-b – this snippet is from the tmux FAQ. @Vlad: Same problem here, on Mac OSX 10.6.5, iTerm and tmux 1.3 built from Macports. setw -g automatic-rename off does not seem to have any effect. Is this a general tmux 1.3 problem or is it a problem with my configuration? I seem to have another problem with tmux: In vim 7.3/Mac OSX 10.6.5, I can copy and paste to/from the system clipboard (with "+y respective "+p.) If vim is running in a tmux session, this does not work any more. Is there a way how I can get this working? Has it some difference to terminator (https://launchpad.net/terminator)? 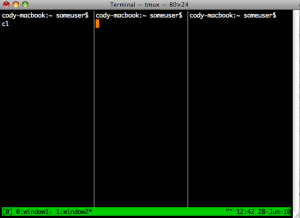 I’m having problems with tmux on my Mac. 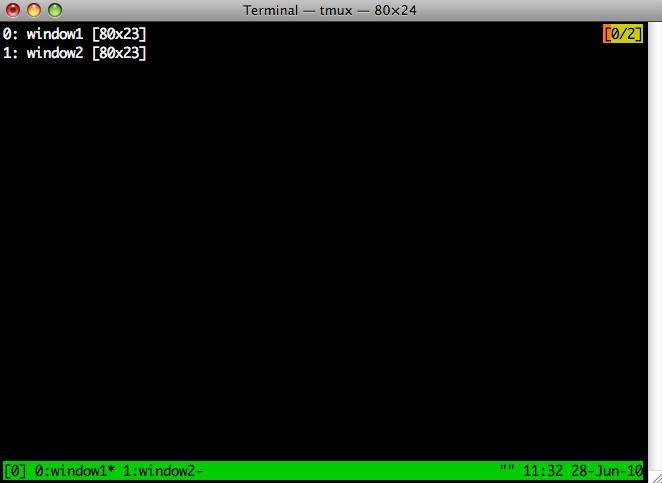 Tmux doesn’t seem to be reading my ~/.tmux.conf. I have tried creating another tmux.conf in /opt/local/etc/tmux.conf and even used the ‘-f’ option to specify the config file to read from but both didn’t work. Anyone has any advice? 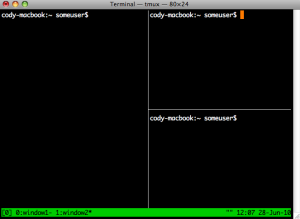 I’m using macports to install tmux on my system if that helps. Same problem here, Gazza. 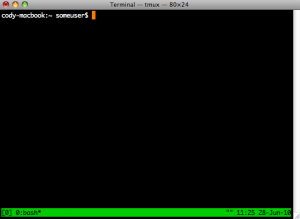 Running Ubuntu 10.10 and using the tmux ubuntu package. 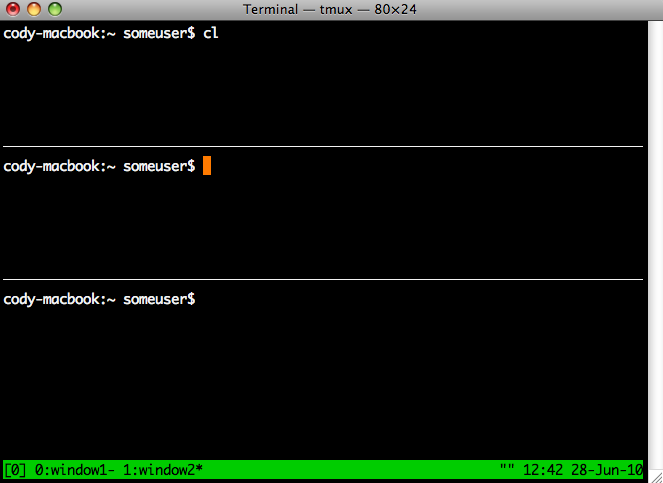 Running strace on tmux shows that it runs access() on ~/.tmux.conf, but never read()’s it. Frustrating. The file is readable. If you are having issues with tmux not reading ~/.tmux.conf make sure that you have stopped all running tmux session because tmux only reads the configuration file when the server is first started. to rerun the config file without restarting the tmux server. Took me 15 minutes to figure this out. Sigh. I have the same renaming problem. Turning off automatic-rename stops the renaming based on the command I’m running in the shell, but if I login to a switch the window automatically renames whenever I enter or exit config mode. Turning set-titles off also has no effect. Does anyone know how to make the current working directory stay persistent after a split? Whenever I split the new shell is at home (~). I tried to map a split key like this “split-window cd $PWD” but that has its own issues with short lived commands. I had the same problem with the automatic window renaming not working, even when “setw -g automatic-rename off” was in the conf file. The issue was it was conflicting with oh-my-zsh. If you delete the /oh-my-zsh/lib/termsupport.zsh file. It fixed my renaming issue. 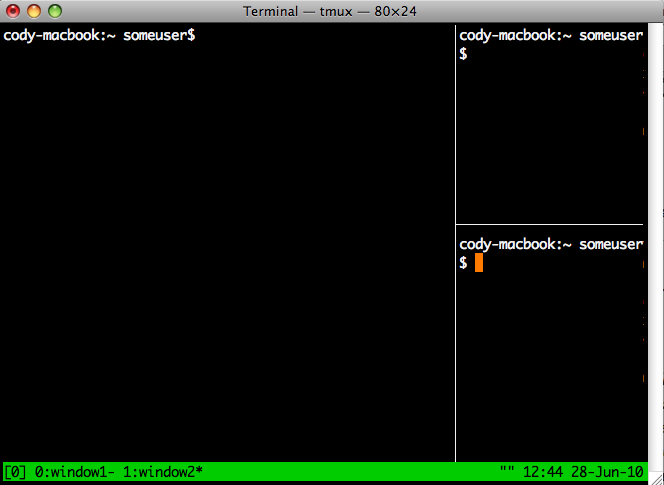 Tmux looks pretty cool and pretty powerful. I am a big fan of byobu ( https://launchpad.net/byobu ) which seems like it shares a lot of overall functionality with tmux. any idea how make tmux wake up my system less often? I think Ctrl-b ” works as well? I’m used to pressing “Ctrl-a” to go to the beginning of a line. With screen, pressing “Ctrl-a” followed by “a” sends readline a “Ctrl-a” to move the cursor to the beginning of the line. Any way of doing this with tmux? c-b work too for moving around the panes. doh! angle bracket arrow keys angle bracket got cut out by the html editor! c-b arrow keys work too for moving around the panes. This is really cool, but does it work with the mouse? I don’t remap the default C-b because I sometimes find myself running screen on a box to that doesn’t have tmux and attaching a tmux session from inside the screen session. In screen, I can do Ctrl-a ” and get a list of screens, and then use the vim keys to scroll up and down (j & k). Is there a way to enable this in tmux when I have a list of windows? and consequently have no clipboard access. 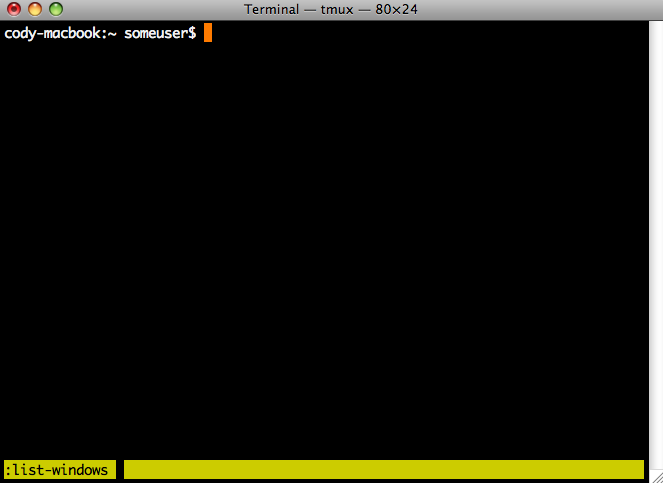 This is the one big drawback with tmux. Is there some env setting or whatever I can set before starting tmux to propagate the access permissions to shells started inside tmux? 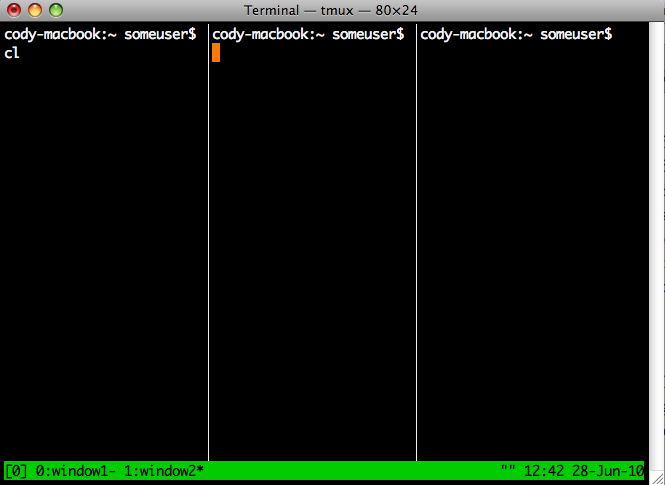 tmux is well designed, documented, and useful. it is a great replacement for screen. nice outline, examples, and screenshots. thanks for writing. great work. P.S. the OpenBSD man page has some additional good examples. 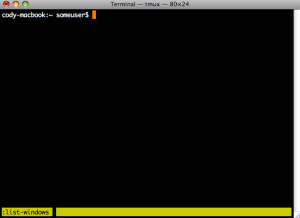 I’m new to tmux. This post serves as a really nice tutorial for me. For “Ctrl-b : “split-window” (Split window horizontally)”, I think the key binding Ctrl-b ” works. @Vlad, the same problem with autorenaming! For anyone that is running into issues with the windows auto renaming, who’s also running Zsh/Oh my zsh, I found a fix. Remove the check for screen* altogether and this should fix it!